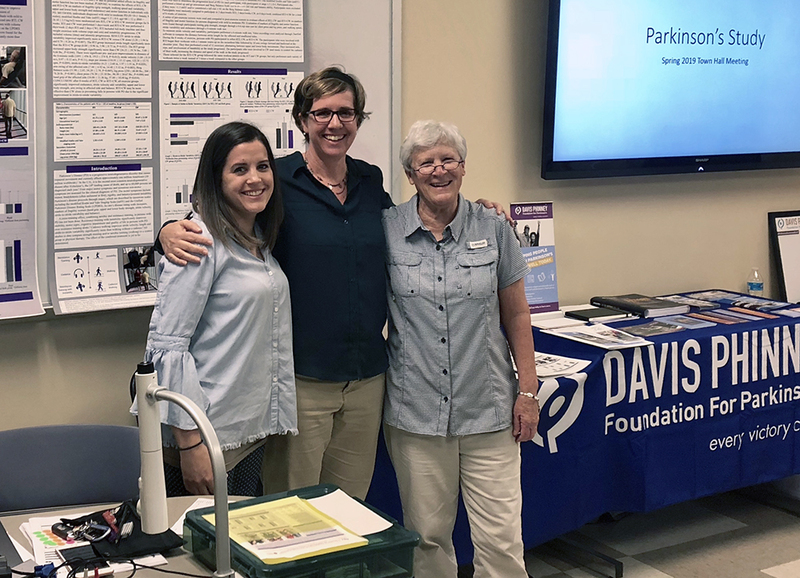 (From left) Annie Bane, Dr. Lindsay Edwards and Dr. Lorraine Wilson are three of the seven faculty members who worked on the Parkinson's study. Within months of being diagnosed with Parkinson’s disease, Lorraine Wilson (’76) had a plan of action in place. “I don’t move slow if I don’t have to,” she said, in her matter-of-fact way. The diagnosis came in February 2017 when Wilson was 62. Other ACU faculty and students didn’t know it at the time, but they were included in her plan of action –and now they’re glad they are. A major part of the plan – education – was in the spotlight last month when Wilson’s colleague, Annie Bane (’07), and several ACU students presented posters at a meeting of the Texas Chapter of the American College of Sports Medicine in Fort Worth. 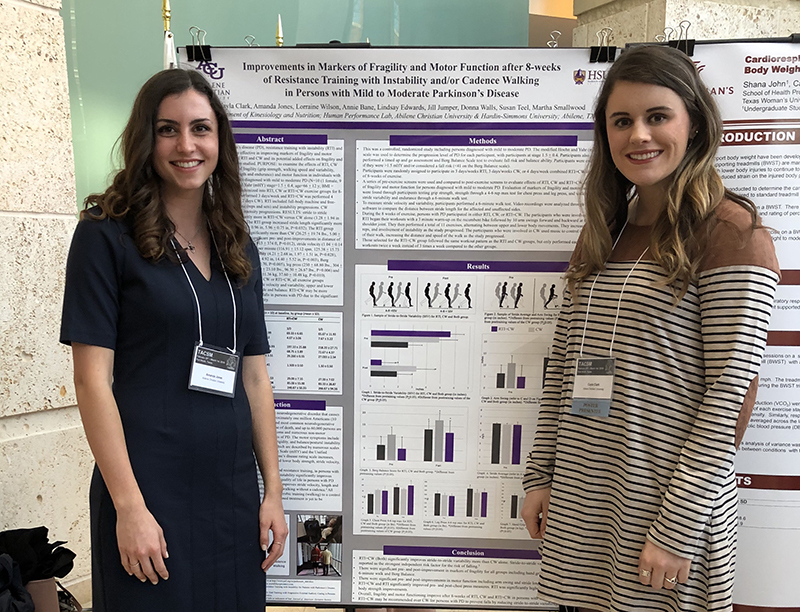 Amanda Jones, left, and Cayla Clark are two of the four ACU students who presented posters at a meeting of the Texas Chapter of the American College of Sports Medicine. 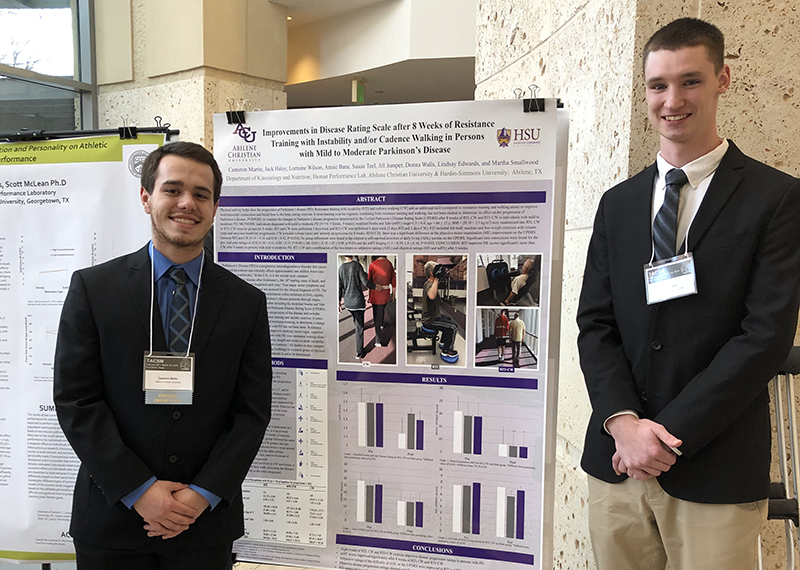 The professionally designed posters were the result of research conducted by faculty and students in ACU’s Department of Kinesiology and Nutrition. They worked with 18 Parkinson’s disease patients, carefully recording their progress over eight weeks of resistance training with instability and/or cadence walking. The eight-week project wasn’t just for the benefit of faculty and students. Wilson, who retired as a professor of kinesiology in May 2018, wanted it to benefit the participants who volunteered to be a part of the study. “We wanted the participants to be able to walk not only better with improved gait and balance, but faster and farther,” she said. What made this study different was the emphasis on cross-training, combining resistance training with instability and/or cadence walking, Wilson said. Resistance training with instability refers to incorporating wobble disks when using machine weights and trying to balance while standing on unstable objects. At the end of the eight weeks, the study participants showed significant improvement on the disease rating scale and in markers of fragility and motor function. Those improvements were featured on the two posters. The poster presentation was just one outcome of the study. An ultimate goal is to present a paper and have it published in a professional journal. Cameron Martin, left, and Jack Haley also presented a research poster at the meeting. All four students are kinesiology majors at ACU. Working on the study from ACU were students Cameron Martin, Jack Haley, Cayla Clark and Amanda Jones, and faculty members Bane, Dr. Martha Smallwood (’70), Dr. Donna Walls and Susan (Boyd ’85) Teel. Participating Hardin-Simmons University faculty were Dr. Lindsay Edwards (’96) and Dr. Jill Jumper (’96), who both earned degrees from ACU. Wilson is especially happy to work alongside Edwards and Bane, who were her former students. Wilson’s determination not to move slowly if she doesn’t have to is on full display from morning until night. She jokes that she may “shake, rattle and roll,” but she still teaches aquatics, exercises, travels, takes care of the house, and helps organize research studies. Her determination not to let Parkinson’s disease rule her life has led to involvement with the Davis Phinney Foundation, which provides information, tools and inspiration to people living with Parkinson’s. She recently was named a Davis Phinney Ambassador, one of the foundation’s “living well leaders.” And she is working with the administration of Abilene Christian Schools to bring the foundation’s Sidekicks program to the campus. Sidekicks is an intergenerational program that brings together youth and people with Parkinson’s to share their stories in fun and creative ways that promote mutual understanding and foster connections. Wilson remembers well the day in February 2017 that she was diagnosed. The process started several years before the diagnosis when Wilson mentioned to her doctor that she had experienced a tremor in her ring finger. Eventually, she was diagnosed with Parkinson’s disease. Wilson remembers being in a dark place after the diagnosis, a place she isn’t used to being. Always the educator, Wilson started boning up on Parkinson’s and involving others to reach out to local people with the disease. By mid-2017, Wilson had assembled a multi-disciplinary team of colleagues at ACU, including four with Parkinson’s, to begin the study that was the focus of the poster presentation. She explained that for decades she taught a class called Lifetime Wellness, in which she challenged students to focus on what she called the fab four of living well – physical wellness, spiritual wellness, social wellness and emotional wellness. Always the teacher, Wilson now finds opportunities to share that philosophy with others with the disease.